We've stepped into an exciting new chapter at just-style, with the launch of the first issue of our new just-style magazine. 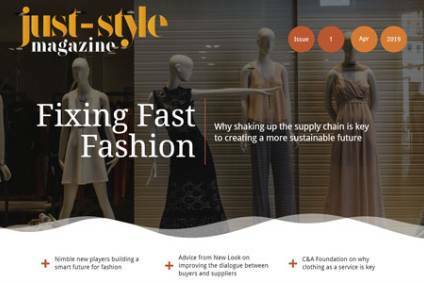 Each quarter this free digital publication will explore major topics that are top-of-mind for today's apparel industry executives, plus regular sections on key market developments, sourcing strategy, new technologies and sustainability. It's been 20 or so years that we've been publishing just-style, it's fair to say we haven't deviated far from our original format of delivering a daily online digest of news, insight and analysis on the global apparel industry and its supply chain. After all, as the saying goes: "If it ain't broke, don't fix it" – and the fact that not only has our audience grown, but many of our readers have also been with us since the very beginning, suggests we must be doing something right. Part of this success is due to our ability to spot key challenges and opportunities impacting the apparel industry worldwide, and then calling on our global network of expert contributors to unravel and contextualise the implications to help you make the best business decisions. Likewise, we've not rested on our laurels either, and we're constantly adapting just-style, our products and services to best meet your needs. Over the years our six site updates have tapped into the latest digital technologies to ensure just-style can be easily accessed via portable devices such as cell phones and tablets. Spin-off products include new launches like our popular PLM Buyers' Guide, which provides a wealth of information on product lifecycle management software and how it is being used within the global fashion industry, as well as a company directory that lists PLM vendors, consultants and events. And of course there's the re:source by just-style strategic sourcing tool, the latest addition to our portfolio unveiled last year. A mammoth undertaking in terms of technical development time and the sheer volume of data that it contains, re:source navigates the complex matrix of global trade rules and regulations, tariff and trade data, country profiles, risk, product categories, and even price. In fact, there's everything you need to create strategic sourcing plans – and all entirely focused on the apparel industry. Which now leads us on to the next chapter. Our line-up has just got even bigger with the launch of the new, free quarterly digital just-style magazine. Designed in an easy-to-digest online format, each edition will include a deep-dive into a major theme – along with regular sections summarising key market developments, sourcing strategy, new technologies and sustainability issues. The first – which you can read here – takes a closer look into the challenge of Fixing Fast Fashion, including the findings of a new study that proposes three practical steps to "fix" the fast-fashion supply chain, some of the sustainability challenges facing the sector, advice from New Look's head of buying on how to strengthen buyer-supplier relationships, and C&A Foundation's vision for turning consumers into customers. Other highlights include a look at some of the nimble new players shaking up the traditional retail model; and the risks and ramifications that arise for suppliers from the purchasing practices of apparel brands and retailers. The thinking behind this new just-style magazine is that it will complement the main just-style site's up-to-the minute daily focus by giving time-poor executives another way to keep on top of apparel industry issues and stay ahead of the competition. We hope you enjoy it.